Our vintage-looking, engraved jewelry box would make an excellent thank you gift for your bridesmaids or flowr girl. They can store their personalized wedding party jewelry in this classic box and use it as they get ready for their own wedding day. This 5" x 6" Victorian style jewelry box is plated with nickel to give the box a shiny silver look that will not tarnish. The cover is hinged with a beautiful scroll design bordering the cover. The bottom of the box is lined with dark blue flocked cloth. The box has 4 feet with a lion head design at the top of each feet. The cover allows free personalization of any name. Additional Details Our beautiful Victorian jewelry box is a personalized gift that she'd really love! We highly recommend giving this to the girls who are standing up in your wedding. 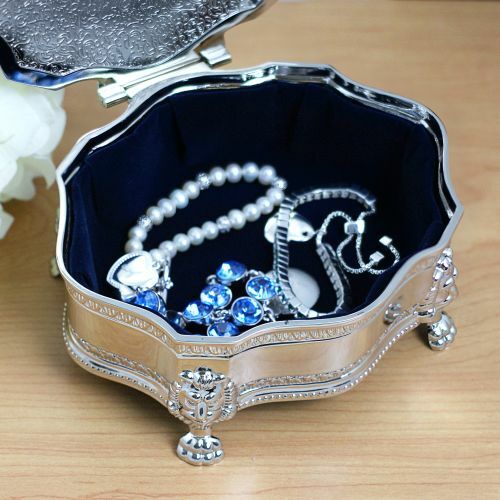 Not only can they use it to store their prized jewelry, but it'll also be a reminder of their role in your special day.